The Hex side table has a hexagonal tapering base giving rise to a precision engineered brass neck that supports either a round or hexagonal top. 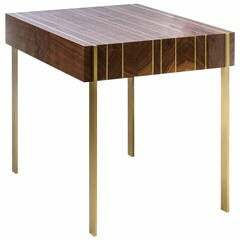 Shown here in ebonized oak and machine turned solid brass. The brass is available in either a natural or bronzed finish. We finish our brass with Jade oil or Renaissance wax. Over time the finish will gently patina. Each Stuart Scott piece is built by hand in our workshop in Wiltshire, England. Nothing is mass-produced. This ensures complete attention to detail, structural integrity and sheer build quality. We never compromise. When we finish each piece, it is signed and numbered: a unique hand-made masterpiece. Registered design No. 4042285 / 4042286. Sleek and light, these centre tables are original and fresh. 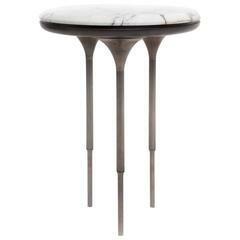 The brass or copper base and the table top available in marble allow different combinations to suit every color scheme.